First, the black bear was of the blonde variety – along with possibly cinnamon, by far the most rare of the four black bear color phases. Then, there was the fact that Bernie Barringer spent four years trying to arrow a blonde black bear so as to complete what might be the first – and only – black bear grand slam by a bowhunter. And then there was the surrealism of that hunt itself. 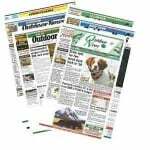 Barringer, of Brainerd, Minn., will again be a headliner at the 2019 Outdoor News Deer and Turkey Classic, March 8-10 at the Minnesota State Fairgrounds. At the Classic, he’ll also have the mounts of each of the four black bear color variations – black, brown, cinnamon and blonde – that he shot by bow, a grand-slam feat that took eight years to complete. And while his seminars will address “How to Bait Big Bears” and he has a real passion for “do-it-yourself baiting and getting these big bears to come to the bait,” he will likely find himself revisiting that life-changing bear hunt last June in far-northern Saskatchewan – at the Classic and most every day of his life. He even shot a blonde bear during a hunt in the spring of 2018. But tracking efforts failed to turn up the bear. “That was the lowest point of my bowhunting career,” Barringer said. But, as is often the case for hunters, the hunting rollercoaster would quickly take an upturn for Barringer with the trip soon after to very-remote northern Saskatchewan. “It was way the heck up there,” Barringer said of the location. “It was a planes, trains and automobiles type of thing to get there – just south of the Northwest Territories border. It was quite a production just to get you there – an amazing place with a lot of bears and a high number of blonde bears. The bear stood there, curious, for a moment. 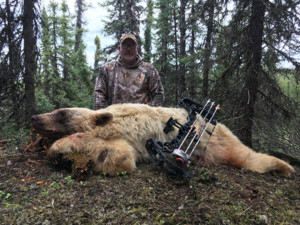 Barringer scrambled to get his bow and to get situated, drew the bow, and when the bear bent down to get bait that had been placed at the trail-cam site, he shot it from about 15 yards. It ran about 60 yards before falling over dead. “It was eight years,” Barringer said of the grand-slam quest, “and I got him five minutes into that hunt. Barringer isn’t sure if he’s the first – or last – bowhunter to accomplish the feat as he said there is little such record-keeping. While more than 85 percent of black bears are indeed black, there are geographic variations that also include cinnamon (reddish brown), chocolate (dark brown), and blonde. Only 2-3 percent are blonde and cinnamon, while about 10 percent are chocolate, occurring in only the western half of North America. Barringer has been a mainstay at the Deer and Turkey Classic, and this year, “I want to help people shoot a mature bear,” he said. “Too many young females are being shot. Shooting young females doesn’t help the population. So if bear hunters really know how to target large males … The goal is to help them shoot more males than females. It’s better for bear management. And expect the display of the four color variations of black bears to draw some attention at the Classic, too. “Most of the hunters haven’t seen anything but black bears. The blonde bears are really amazing looking,” Barringer said. Videos of Barringer’s grand-slam journey can be found at https://youtu.be/XM2d39DB2QI and https://youtu.be/P2yfleno3yM.